I was desperately looking for a photo op last evening and I could not find any! 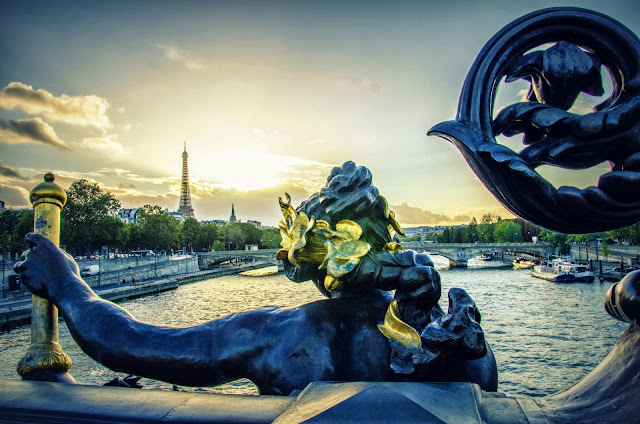 I even thought of leaving a blank space for once... And then I passed by the Pont Alexandre III! I know I probably posted this view a dozen times, but there is always a new angle, a different light or color! I don't think you can ever get tired of this view ;-) I'm sure this Neva river Nymph is not! What a shot! You frame pictures so nicely. When I was in Paris, I took nicer pictures, but nothing as imaginative as what you take. Eric, I don't know how you constantly find new ways of looking at things. This is extraordinary. I can't stop admiring this awesome, lovely, colorful photo. It's an 11/10! Zeus summons Niva the river Nymph to appear before him at Mount Olympus. "OK Neva, it's good news and bad news. First the bad news: Henceforth your stare will be forever fixed on one view. Now the good news: This is the view." Couldn't find a photo op, eh? Well, you certainly solved that problem—and brilliantly. This is superbe! This is stunning! I can't imagine not finding a photo op in Paris. We love to see everything you post from street scenes to people. it's magical to us.